Even in his age-33 season, Staley turned in another stellar campaign, finishing as our top-graded tackle on the year and his play within the NFC West was no exception. 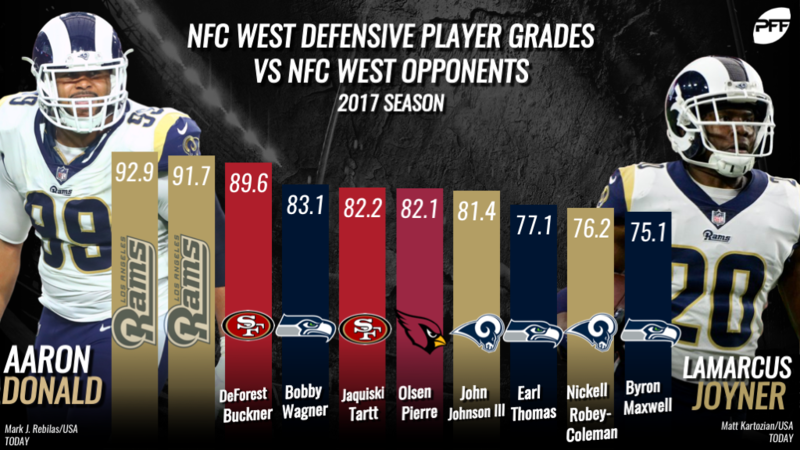 Staley was dominant in both facets, earning both the highest pass-block (86.3) and run-block grades (87.1) of any NFC West lineman in divisional games. The wily vet’s performance against the Rams was especially top notch, with Staley keeping a clean sheet in pass protection across 80 pass-block snaps on his way to his two highest game grades of the season. One of the holdovers from a Rams offensive line that took a big step forward from 2016 to 2017, Havenstein is a name that probably comes as a bit of a surprise in the No. 2 spot. The former Wisconsin Badger has been a consistent performer at right tackle since entering the league, and his NFC West opponents saw his best efforts last season. Havenstein made his mark in the run game, where his 81.5 run-block grade trailed only Staley (and former 49ers tackle Trent Brown, who would’ve held this spot on the list had he remained in the division). As a pass protector, he surrendered only a lone sack to Dion Jordan in Week 15. Somewhat remarkably, Woods is the only skill-position player to crack the top five of this list. Woods didn’t drop a pass in divisional play, hauling in all 22 of his catchable targets. He was efficient with those targets as well, producing 17 first downs and averaging 2.14 yards per route run, making him the only NFC West player to clear the 2.0 threshold. In an O-Line-heavy top five, the Rams see another make the cut. Saffold turned in a career year, earning an 80.3 overall grade that ranked fifth among guards last season. Against divisional opponents, Safford surrendered just six total pressures on 174 pass-block snaps, giving him the lowest pressure rate allowed among NFC West guards last season at just 3.5 percent. Injuries limited Humphries to only 204 snaps last season, but 131 of those came against NFC West opponents. And while that’s certainly a limited sample size to work with, the young tackle was showing improvement in his sophomore campaign, increasing his overall grade to 81.7 from 68.3 as a rookie. Humphries’ shortened season was highlighted by a strong Week 9 performance against the 49ers where he earned a 91.8 run-block grade and gave up just one hurry on 32 pass-block snaps. Whitworth’s presence was a big part of the Rams’ improved play up front last season, but allowing four of his six sacks in divisional play keeps him from ranking higher on this list. Fitzgerald paced the division with 10 explosive plays (20 yards or more), eight of which came when lined up in the slot. 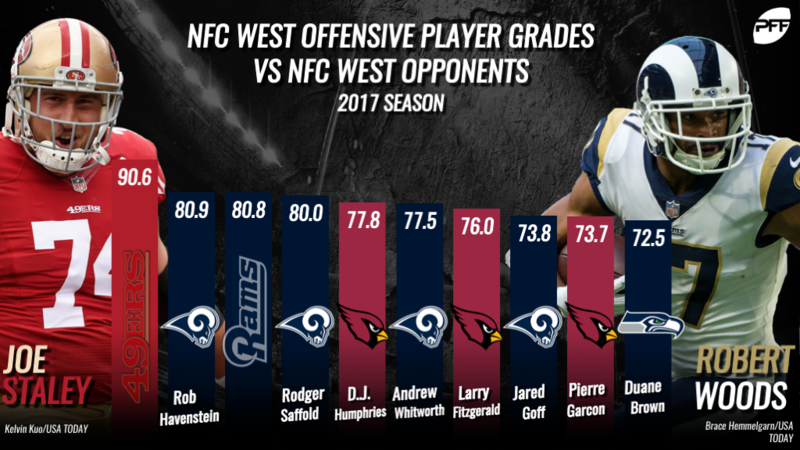 Goff’s passing grade of 74.6 was best in the division, and his seven ‘big-time throws’ were tied with Russell Wilson for the most in NFC West play. Garcon’s injury-shortened season was punctuated by his Week 3 performance against the Rams, where the veteran wideout had his way with Trumaine Johnson to the tune of five receptions for 133 yards and five first downs. After joining the Seahawks midway through the year, Brown allowed seven total pressures in 136 snaps against divisional opponents, with no sacks and just one hit. It should come as no surprise that the best defensive player in football last season also terrorized his divisional foes. Donald’s 36 total pressures were six more than any other NFC West defender, and he made life especially miserable for the Seahawks, recording a pressure once every 3.5 pass-rush snaps on his way to 19 quarterback pressures across two games. Joyner’s transition from slot corner to safety proved to be a fruitful one, as the Florida State product finished the year as our second-highest graded safety behind only Harrison Smith. Deep safeties don’t find themselves in primary coverage too often, but Joyner took advantage when those opportunities presented themselves, forcing three incompletions and allowing just one first down on seven targets. An iron man on the defensive line, Buckner broke out in his second season, especially as a pass-rusher. Buckner notched 12 quarterback hits in divisional play (of his 19 total hits on the season), double that of the next closest defender. Only Donald defeated blocks when rushing the passer at a higher rate, and so long as he continues to win that often, it’s only a matter of time before the sack numbers begin to match Buckner’s excellent grading. Wagner’s versatility is exactly what you want out of a modern linebacker. He rarely misses tackles (only two in 46 attempts last season), he is excellent in coverage (allowed a 61.1 passer rating into his coverage), he led all NFC West linebackers in run stops (16), and he even recorded pressure on one-third of his pass-rush snaps. All that led to Wagner ranking first in both run-defense (72.7) and pass-rush (85.2) grades, and second in coverage grade (80.6) in divisional play last season. Tartt is another player whose season was cut short due to injury, but his performance when on the field was impressive enough to make the 49ers’ brass feel comfortable enough to let Eric Reid walk in free agency. It was in pass coverage where Tartt made his most significant impact, allowing just 34 yards on 11 targets while forcing three incompletions in his four games versus NFC West foes. Pierre’s best game of the season came in the finale versus Seattle, in which he filled up the stat sheet recording two sacks, a QB hit, a batted pass, three stops and a forced fumble on his way to a 90.0 game grade. The rookie safety’s 82.9 coverage grade trailed only Joyner among returning NFC West players. Thomas was stellar yet again last season but was rarely even tested in divisional games, seeing only three targets in primary coverage. The third member of the Rams secondary to land on this list, Robey-Coleman was the highest-graded slot cornerback in NFC West play last season. Maxwell’s was the second-highest graded outside cornerback in divisional play with a 73.9 coverage grade.